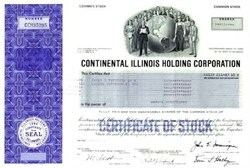 Beautifully engraved certificate from the Continental Illinois Corporation issued in 1984. 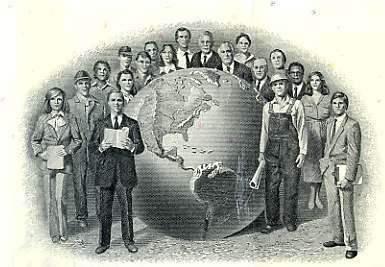 This historic document was printed by the American Banknote Company and has an ornate border around it with a vignette of a group of employees around a world globe. This item has the printed signatures of the Company’s Chairman and Secretary. Light folds. One of the most notable features on the landscape of the banking crises of the 1980s was the crisis involving Continental Illinois National Bank and Trust Company (CINB) in May 1984, which was and still is the largest bank resolution in U.S. history. Although it took place before the banking crises of the decade gathered strength, the Continental episode is noteworthy because it focused attention on important banking policy issues of the period. Among the most significant of these was the effectiveness of supervision: in the wake of the banks difficulties, some members of Congress questioned whether bank regulators (in this case, the Office of the Comptroller of the Currency in particular) could adequately assess risk within an institution. The economic dislocation such a large bank failure might bring also engendered increased scrutiny of the supervisory process. In addition, Continental was a particularly telling example of the problem that bank regulators faced when attempting to deal with safety-and-soundness issues in an institution that had already been identified as taking excessive risks but whose performance had not yet been seriously compromised. Continental's size alone made it consequential. Large-bank failures in the 1980s and early 1990s would prove to have serious consequences for the Bank Insurance Fund (BIF). As the nations seventh-largest bank, Continental forced regulators to recognize not only that very large institutions could fail but also that bank regulators needed to find satisfactory ways to cope with such failures. The methods adopted in the resolution of Continental gave rise to a great deal of controversy, with the debate centering on whether large banks like Continental had to be treated differently from smaller institutions.